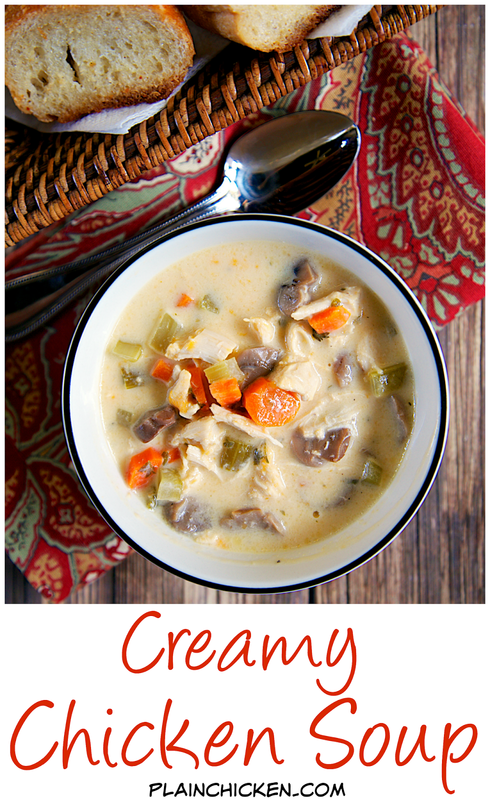 Creamy Chicken Soup Recipe - chicken, celery, carrots, mushrooms, chicken broth, cream of chicken soup, half-and-half and cheese! 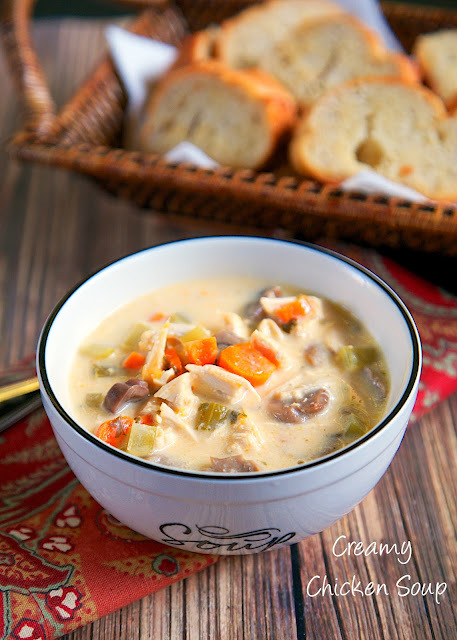 Can use rotisserie chicken for a super quick meal or boneless chicken breasts for an easy slow cooker meal. Freeze leftovers for a quick meal later! I got this recipe from my Mom. She always has recipes for me to look at when I go down and visit. This soup caught my eye. 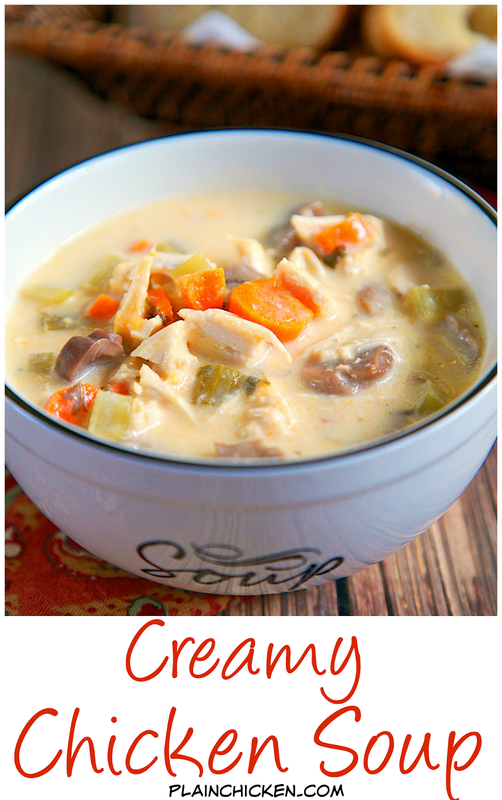 It is loaded with chicken, mushrooms, carrots, celery and finished off with some cheese and half-and-half. It is super delicious. If you aren't a mushroom fan, feel free to leave them out. It will be just as good without them. I made this in the slow cooker. If you want a super quick stovetop meal, use some cooked chopped chicken instead of uncooked chicken breasts. I like to use rotisserie chickens for the cooked chicken. Bring the first 8 ingredients to a boil and boil for about 15 minutes. Reduce the heat to simmer and add the remaining ingredients. Cook for a few minutes more and serve. This makes a ton of soup. It is great for a crowd or a freezer meal later. I made a batch of this last week before my Paris trip. I froze the leftover so he could eat it while I'm gone this week. I love these GladWare Soup Containers - http://amzn.to/1ixvtXS. They work great for individual servings. 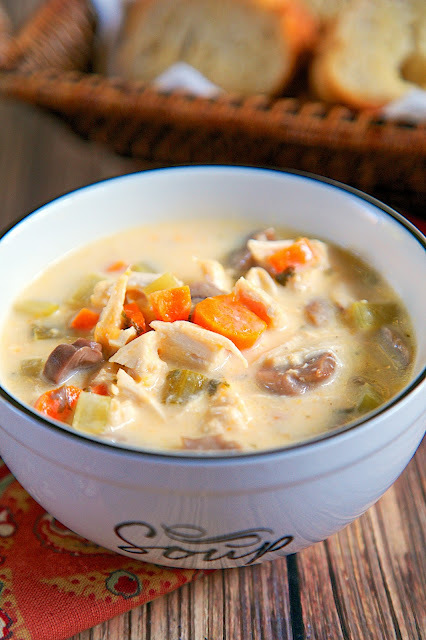 Place chicken, broth, bullion, water, celery, carrots, cream of chicken soup and mushrooms in slow cooker and cook on LOW for 6 to 8 hours. Remove chicken from slow cooker and chop. Return chicken to slow cooker. Stir in half-and-half and shredded cheese. Cook on HIGH for 15 minutes, until cheese is melted. Stir and serve warm. *Stovetop directions - use 1 rotisserie chicken for the chicken breasts. 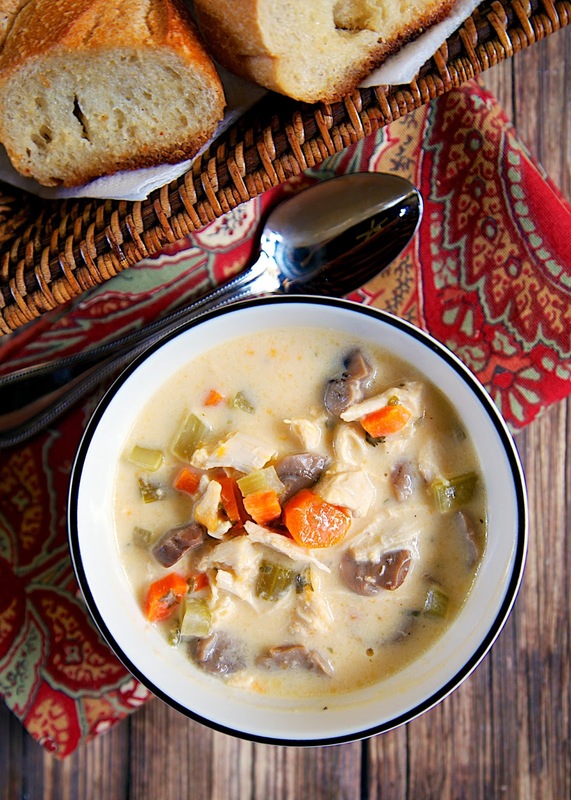 Place first 8 ingredients in a Dutch oven. Bring to a boil and cook for about 15 minutes. Reduce heat to simmer, add half-and-half and cheese. Cook until cheese is melted. Mom's recipes are always the best! Can't wait to try this one! Made this soup over the weekend and it was wonderful!! My Husband felt it needed something more, so I did add some egg noodles. Loved the flavor! !